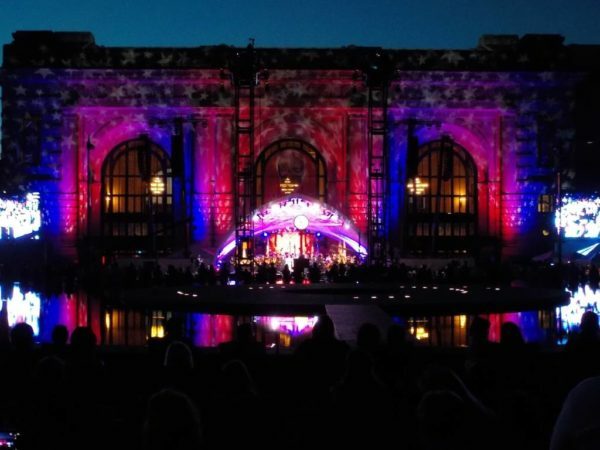 For the past 15 years, Union Station has hosted Celebration at the Station. This annual event occurs on Memorial Day weekend, and honors those who have and are putting themselves in harms way to protect our freedoms. This year was especially significant, as they recognized the 100th anniversary of the United States entry into World War 1. The celebration kicks off in the middle of the afternoon, and continues well after sunset. 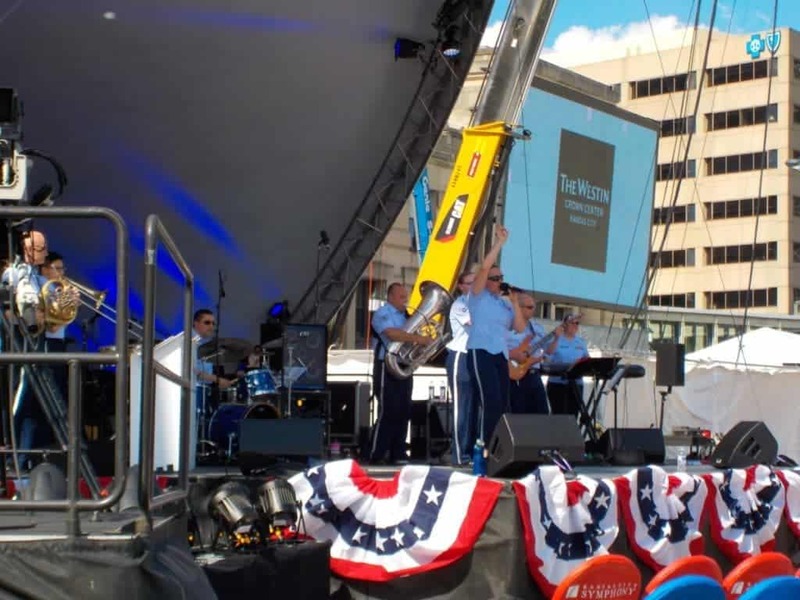 This annual event is free to the public, and is recognized as the largest Memorial Day weekend event in the Midwest. During the daylight hours a variety of bands perform on the main stage, which is set up in front of Union Station. On either side of the stage visitors can find food trucks and vendors. A family area holds entertaining options for kids of all ages. Face painting, coloring, and a musical petting zoo are some of the options to pass the time. 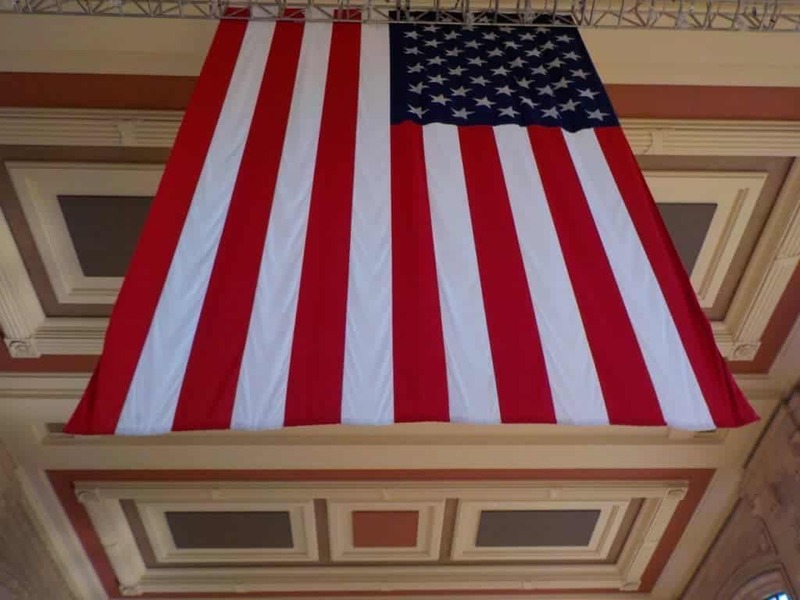 Guests are free to enter Union Station for a historical viewing, as well. Each year that we visit, we like to take the opportunity to wander inside the station, before the big celebration begins. 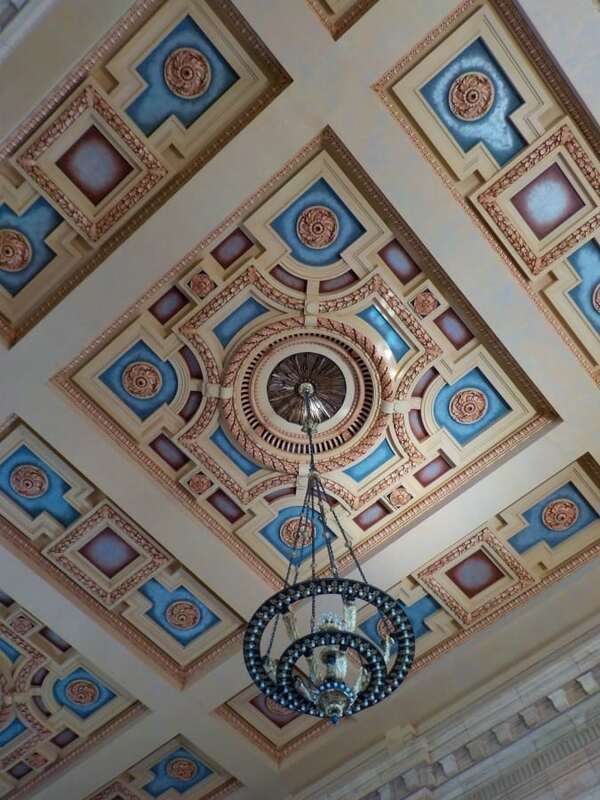 This beautiful building is filled with amazing architecture. It is easy to imagine yourself back in the days that train travel was the norm, and the station bustled with travelers. 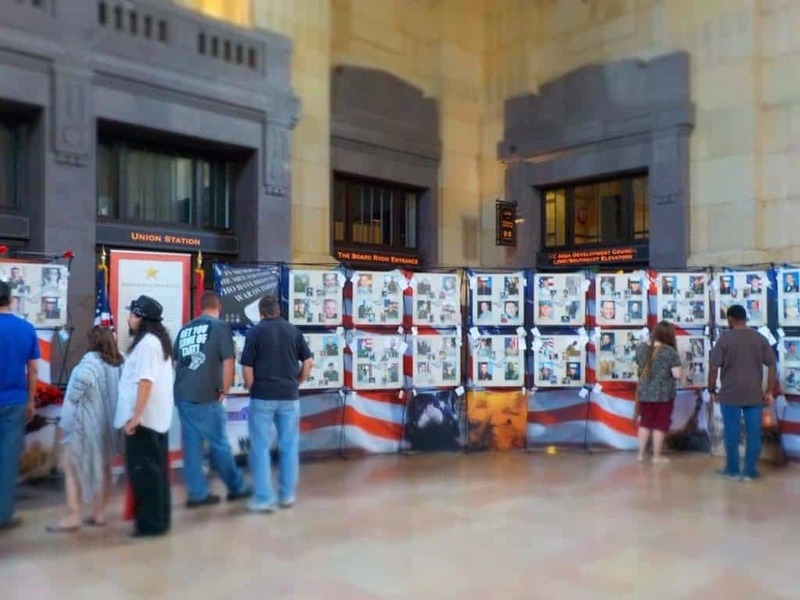 Inside Union Station guests will find a display honoring the fallen soldiers from the area. 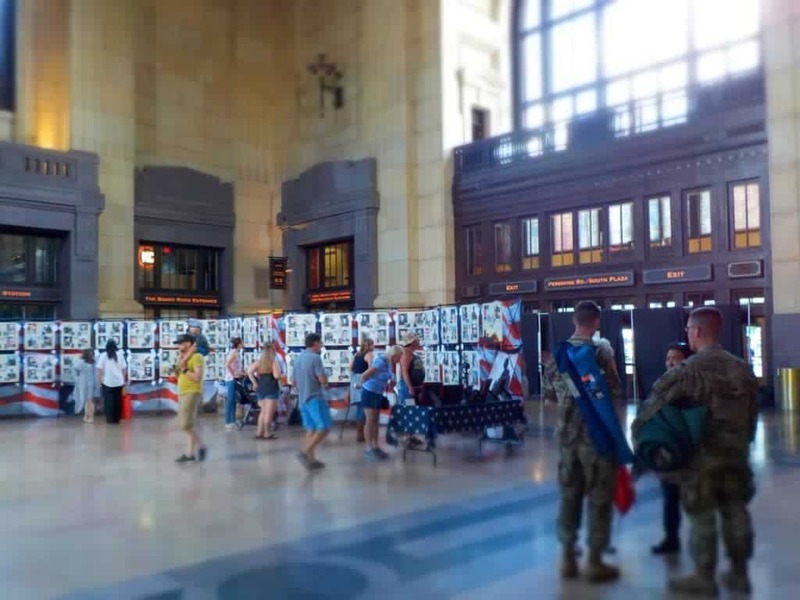 Friends and family are encouraged to leave notes with the pictures for each of the soldiers being honored. It is a poignant reminder of the sacrifice that many make on a daily basis. In front of the station, there were many booths and tents set up with information for and about veteran’s affairs. One new display we saw, was an oversized map of the Vietnam War region. Veterans of this war were encouraged to sign the area in which they had been stationed. It was humbling to watch many veterans meet up and rekindle old friendships. As the day progressed,the crowds continued to increase. Many, like us, choose to come early and make a day of it. 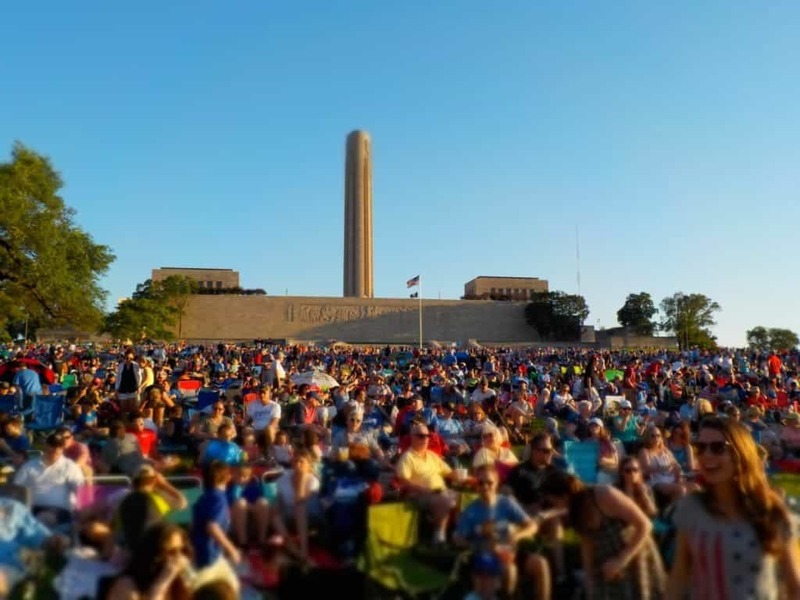 Families and friends gather in their groups to enjoy picnics on the lawn in front of the Liberty Memorial. Kids play catch or roll down the hillside under the watchful eyes of their parents. Conversations occur between groups who were camped near each other, and it seems like one giant family. This is one of the largest gatherings around that is always a peaceful event. It appears that everyone puts aside any differences to join as one in honoring our veterans. 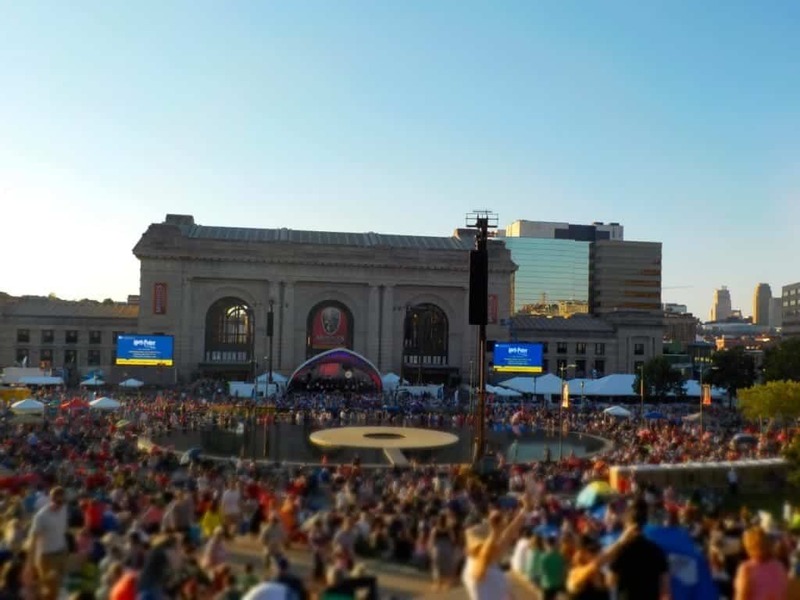 Soon the daylight wanes, and it is time for the celebration to begin, as the Kansas City Symphony takes the stage. The concert always includes some special guests, and this year it was Patti Austin. She performed a medley of Ella Fitzgerald songs, in memory of Ella’s 100th birthday. Many of the musical selections are familiar to most in attendance. Some of the songs are famous marches, patriotic ballads, and light-hearted ditties. As nightfall spreads, it is time for a more serious note. A color guard made up of all of the branches of the military, proceed onto the stage. The band plays the theme of each group, and all across the lawn, members from their specific branch rise at the playing of their song. As they do, the crowd cheers and applauds each group for their service and dedication. 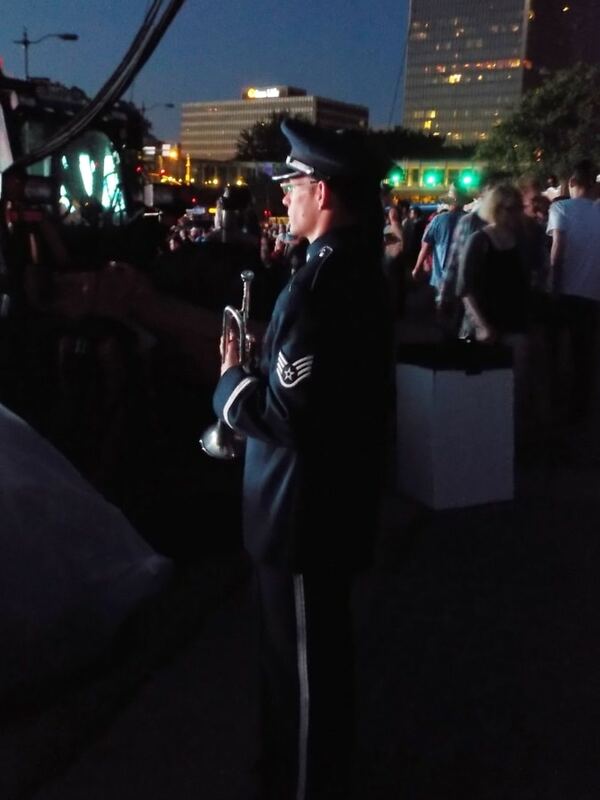 At the end of this medley, a single trumpeter plays Taps, as the crowd stands in silence. A round of cannon fire follows this salute. Each year the symphony concludes with Tchaikovsky’s “1812 Overture”, which includes live cannon fire accents. 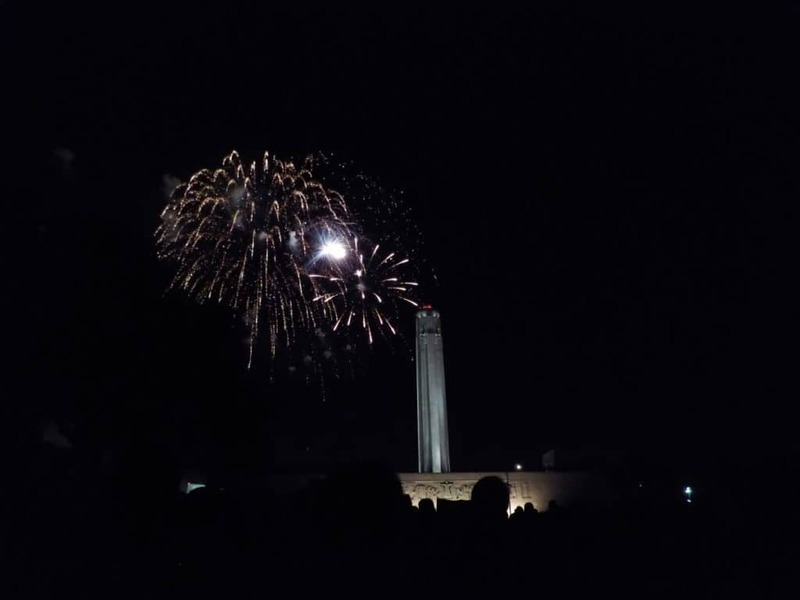 It is a crowd favorite, and it’s ending marks the time for the crowd to turn their chairs towards the Liberty Memorial. The evening events culminate with one of the largest fireworks displays in the Midwest. The fireworks burst in sequence with the music, as the crowd watches in awe. Every year it seems that they outdo the previous display, and each year the crowd says that it can’t get any better. As the fireworks end, the crowds pack up their blankets, and picnic baskets. Another successful celebration, and another chance to teach the next generation about the true meaning of Memorial Day.